The following example is a very simple one to show how to turn a fan on and off according to a schedule. It looks like a lot of steps but there’s explanations and tips along the way, the actual time to do this will be less than a minute once you get up to speed. The first step is to configure the output, click on the controller at Tab1 in the device tree, then click on the outputs at Tab2 to bring up the outputs table grid. At Tab3 we have assigned a short name to output #1, EF101 which is the ‘Label’ we will use in the programming. At Tab4 we make sure this is set to auto so that the program can be in charge of the output. Also check that the HOA (Hand-Off-Auto) column which shows the position of the hardware switch on the device itself, make sure this is in the auto position. At Tab5 we see one switch left in the Man-Off position which is an example of what we don’t want. Next we will set up a schedule for the fan, click on the schedule icon at Tab6 which brings up the list of all schedules in this particular controller. 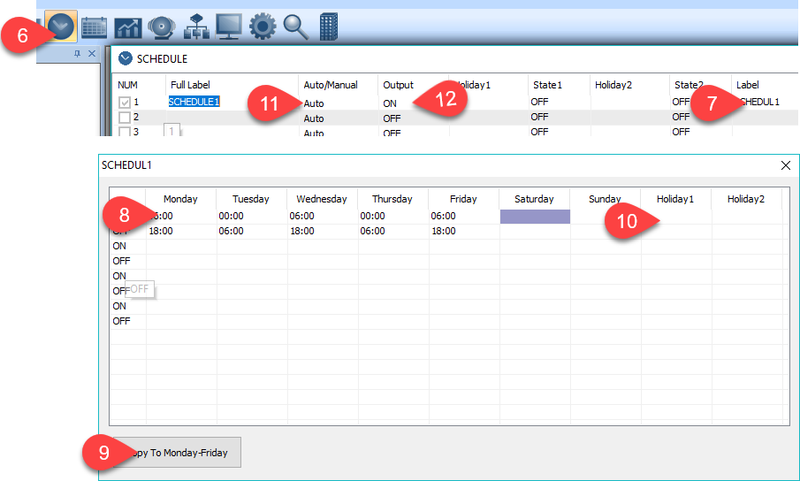 Give the schedule a name at Tab7, in this example its called SCHEDUL1 which is the name we will use in the programming. At Tab8 fill in the start and stop times and then copy to the weekdays at Tab9. You can leave the Holiday schedules at Tab10 blank for now, these will be for defining special schedules on the holidays. Finally we get to the programming which will tie the fan output to the schedule using a bit of simple logic. Click on the programming icon at Tab13 which brings up a list of all the programs in this particular controller at Tab14. Hit the INSert key or lower down you can click on the Programming button at Tab18. This brings up the user programming editor at Tab16. If the schedule is true (on) then start the fan otherwise stop it. This is a very simple program, the logic can become more complex but its best to keep it to one chunk of logic per line because there’s plenty of programming space. Sacrificing clarity to save a few bytes only makes maintenance difficult later. Hit the F2 function key or Send at Tab15 to send the logic to the controller, if the program passes the syntax checking as shown at Tab17 the program will be sent to the controller and begin running immediately. Check that the Status for the particular program shows ON and auto/manual is set to Auto near Tab14. If you need to turn a program on and off for debugging you can do that here. If you are having troubles, double check that the time on our PC matches the time of the controller. 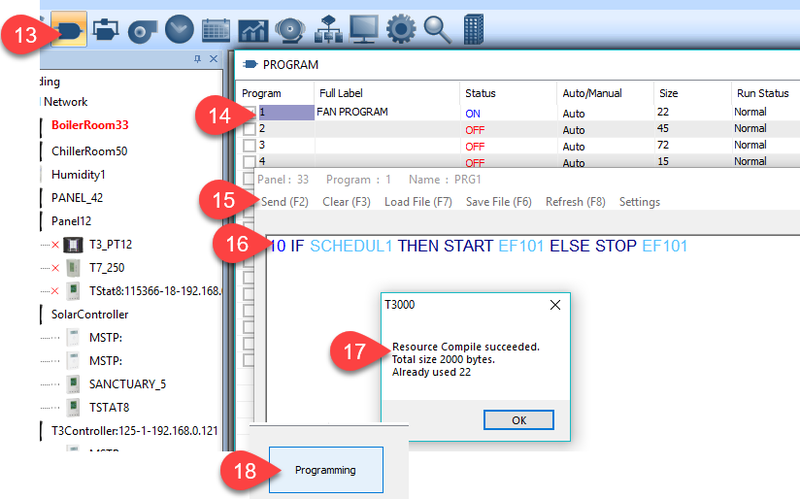 A useful debugging technique is to manually set the schedule to on and off rather than wait for the time events, do that at Tab19 and the output should follow the schedule. The screen takes some time to refresh so allow for that, or jump around to another screen and come back to do a manual refresh. This is an excellent cookbook example. It’s one I intend to use over the next few weeks.